Masha Ovchinnikova is an activist and project coordinator at FrontAIDS, a Russian AIDS activist group. She is a former drug user living in Moscow and has been doing harm reduction work for about three years. She can be reached at Riotmasha (at) yandex.ru. 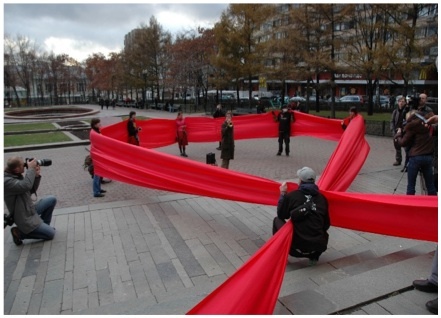 In November 2004, shortly after activists started FrontAIDS, the group protested outside the government administration building in St. Petersburg to demand HIV treatment for drug users. There are more than one million people living with HIV in the Russian Federation, and about 80 percent have an experience of injecting drug use. About 60 percent of people using injection drugs have hepatitis C (HCV), and about five million people in Russia are officially registered as living with HCV. Harm reduction or forced detox? The Russian government is more attracted to taking repressive action against drug use than encouraging harm reduction measures. Now government officials are discussing forced treatment for drug users. Methadone is a medication from the “first list” (the list of most dangerous) drugs, which means it is banned. We tried to raise this question in a meeting with the director of the Russian narcological system, N. N. Ivanez, and he said that it’s absolutely unrealistic to create a methadone therapy system in Russia now. Drop-in centers and needle exchange programs are dependent on the local government’s opinion. In some cities, like Kaliningrad, needle exchange programs are absolutely prohibited. They are interpreted as a form of propaganda for drug use, so people who provide it are subject to arrest. In some places, syringe exchange is legal but, still, it is not well funded. Usually there are just two or three exchanges in each city, and drug users are often afraid of going to such places because they could be arrested near them. Many financial, bureaucratic and moral barriers keep drug users from being able to take care of their health, or sometimes their lives. People can’t receive any medical help at the usual clinics if they are “kicking.” If you want to go into a detox program, you have to wait a few weeks, sometimes more. You have to prepare a lot of documents and take some tests (including HIV testing). Then, there is no guarantee you’ll get good medicine — but what’s for sure is that you’ll be blamed and humiliated by the clinic staff. Another problem is confidentiality of “drug user status.” You can’t get free treatment without official registration, but this list sometimes becomes available to the police. Although the situation has become somewhat better recently, the level of police abuse is still very high. Sometimes it’s still dangerous to buy a new syringe because the police are watching drug users near the pharmacies. There are some “big” organizations advocating on the national level, but the main strategy is for local organizations to negotiate with local government. Also, when possible, activists are trying to educate powerful officials and doctors, holding trainings and seminars for them. Most of this activist work (80 to 90 percent) is done by active or former drug users. It’s very hard to do advocacy in this field because of the huge influence of the State Narcological Control Service, whose opinion is very dependent on the political situation. Before elections, for example, the police can temporarily close drop-in centers or start arresting people around them. Now, FrontAIDS is monitoring access to treatment for HIV, HCV and tuberculosis, to see the difference between the official story (that everyone has access and it’s free, with no discrimination) and the real situation. If we find problems, we will try first to negotiate. If that doesn’t have a result, we will have protests and demonstrations. I think the more we attract international attention to the problems faced by drug users, and in Russia in particular, the sooner the situation will change for the better. The only context where the problems of drug users are discussed on the official level now in Russia is within the HIV and HCV epidemics. There is no comprehension of the rights of drug users as human beings, as members of society. do you see alcohol as a drug in Russia? I think alcohol is the most dangerous drug! it’s social exepted and therefore it’s legal to get pissed off with that. In finland alcohol is THE killer number 1. Other drugs comes as a beside of heavy drinKING. But yes, other drugs are coming to be a huge problem too. Is it our societies that create users because off unemployment, mental issues (depression) etc.? Cultural heritage? Thanks for commenting! I completely agree with you about alcohol causing so many problems — it’s true in the United States. As Masha wrote in this article, it’s outrageous for methadone to be illegal, when it is needed for people to heal and recover. I think alcohol use does have a lot to do with unemployment and depression, and the loss of dignity when there are no decent jobs. And it makes no sense that drug users are so stigmatized, when everyone drinks alcohol. I think that drug, alcohol and other social problems were swept under the carpet in Russia during the communist regime and the structures are still not in place to deal with the problem at a social level, only by punitive measures which are probably ‘shutting the door after the horse has bolted’. Russia needs to catch up with the west in some respects such as the de-classification of methadone and the problem needs to be reframed in terms of treating these kids or long-term addicts and not simply criminalising them. By the way I also agree with Baltic Bullet that alcohol is probably the biggest social problem facing Russia right now! Thanks so much for commenting! I’m so sorry for the delay, I was away visiting relatives. Your comment adds a lot to my understanding of this issue. I think that what you published made a ton of sense. However, think about this, what if you were to write a awesome title? I ain’t suggesting your content isn’t solid, however suppose you added a post title that makes people want more? I mean Harm Reduction Activism in Russia | AIDS and Social Justice is kinda boring. You should glance at Yahoo’s home page and see how they create post titles to grab people to click. You might try adding a video or a picture or two to grab people excited about everything’ve got to say. Just my opinion, it might make your posts a little bit more interesting. Thanks for the tips! I’ll use them for future posts. This article is actually very old, but I’ve kept it on here for archival purposes in case anyone is doing research on these issues.